Living in a Prius creates minimalist thinking, and this week I was at the Container Store and saw this very small umbrella (right-above). I didn't carry an umbrella the last 2 Prius Travel years, as I was still working on reducing the number and size of things and feeling a bit too crowded. 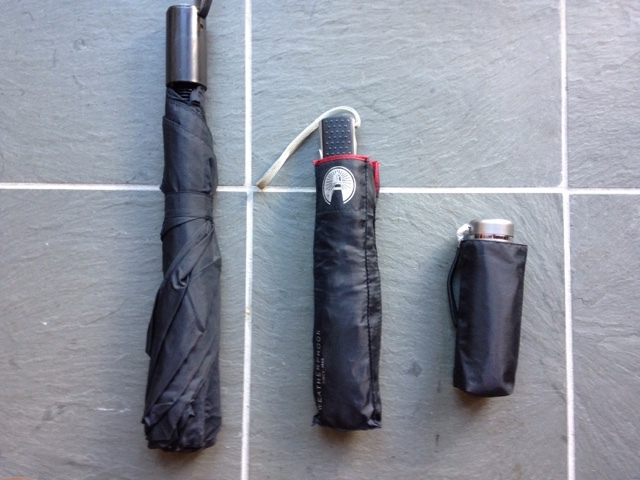 I have reduced the size of many things and cut back on what I carry and there is a need for an umbrella as I learned at the SE GTG this past spring. I do carry a rain suit and my hiking boots are waterproof. But there were a few times that an umbrella would have been helpful. 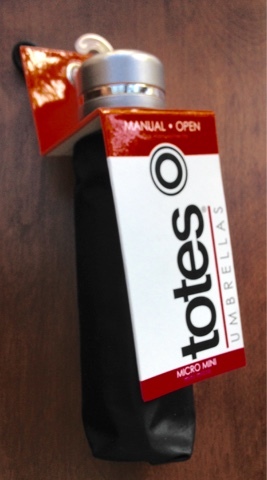 The small umbrella I found does not have the push button opener so it is called manual. I can handle manual, even though one handed push button actuation is a very nice feature. Size does matter when living in a Prius.